Boss Hen in all of her feathered glory. Cluck cluck cluck? Cluck cluck cluck cluck. “Who are you? You are not Bryan,” Boss Hen observed suspiciously. Clearly she was upset. She pecked at my shoe. Cluck cluck! “Take that!” Or maybe it translated “Not edible.” I was still learning Chickenese. Edibility, I discovered, was Boss Hen’s primary criteria for judging everything. I threw out a handful of chicken scratch (coarsely ground corn), which chickens regard as dessert. 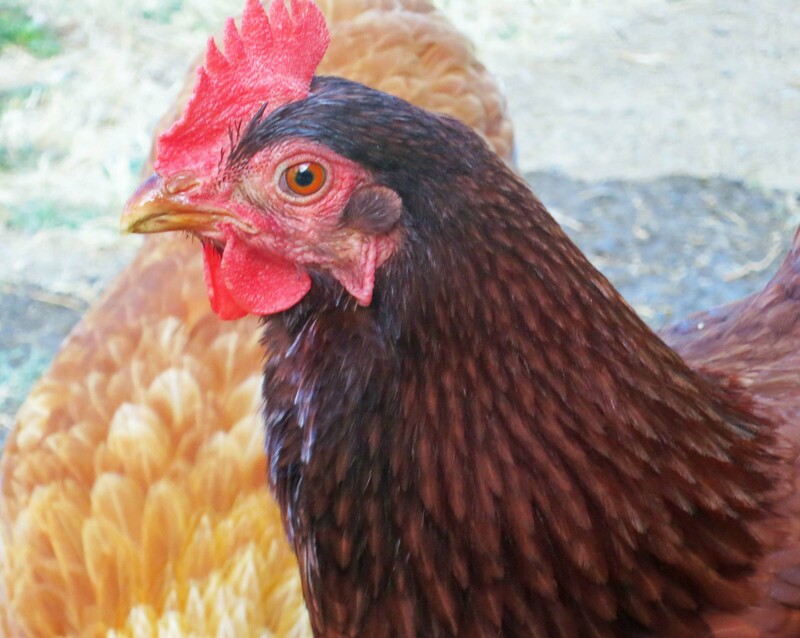 I was immediately forgiven for ‘not being Bryan.’ Boss Hen and her three cohorts— the Gang of Four, as I came to know them— begin pecking away at the ground and softly clucking about what a great guy I was. The Gang of Four, rulers of the roost. Portrait of a gang member. Our neighbor Brian had requested that I care for his chickens for a week while he and his family went for a vacation on Vancouver Island in western Canada. Of course I said yes, but I had reservations. My knowledge of chickens was limited to brief encounters as a child and as a Peace Corps Volunteer. Would Bryan arrive home and find that his fowl friends had fed the neighborhood fox? Our family had raised a few chickens for eating. I had a vague memory of the experience, mainly of chopping off heads, sort of what you would expect a seven-year old boy to remember. But I also recall that my sister Nancy refused to eat them. She had given the chickens names and followed them around, turning over rocks so they could catch any lurking bugs. “I will not eat my pets,” she had insisted stubbornly. My perspective had been that chicken and dumplings are chicken and dumplings: mmm, mmm good. My three Peace Corps chicken memories were more vivid. 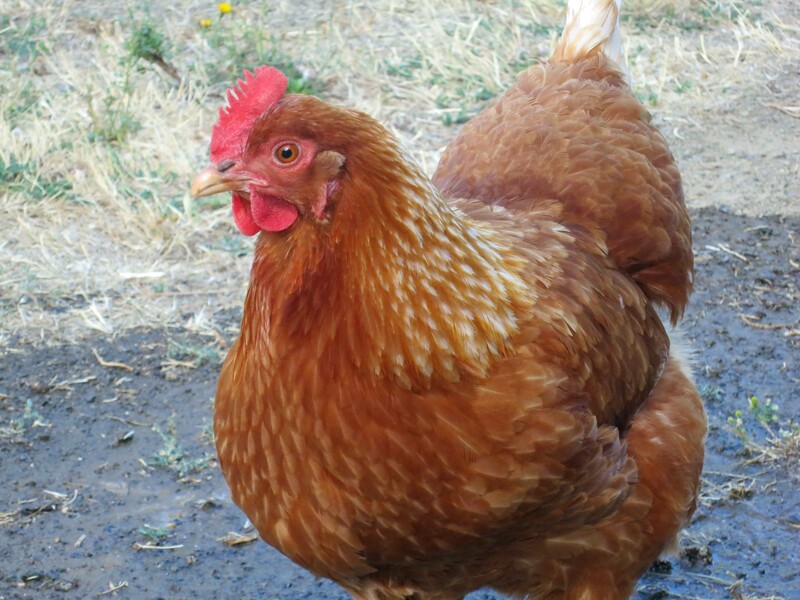 First, a Peace Corps staff member had shown up during training in California with a crate of live chickens, a hatchet, a large pot, and a box of matches. “Here’s dinner,” he had announced casually. We were left to work out the details. 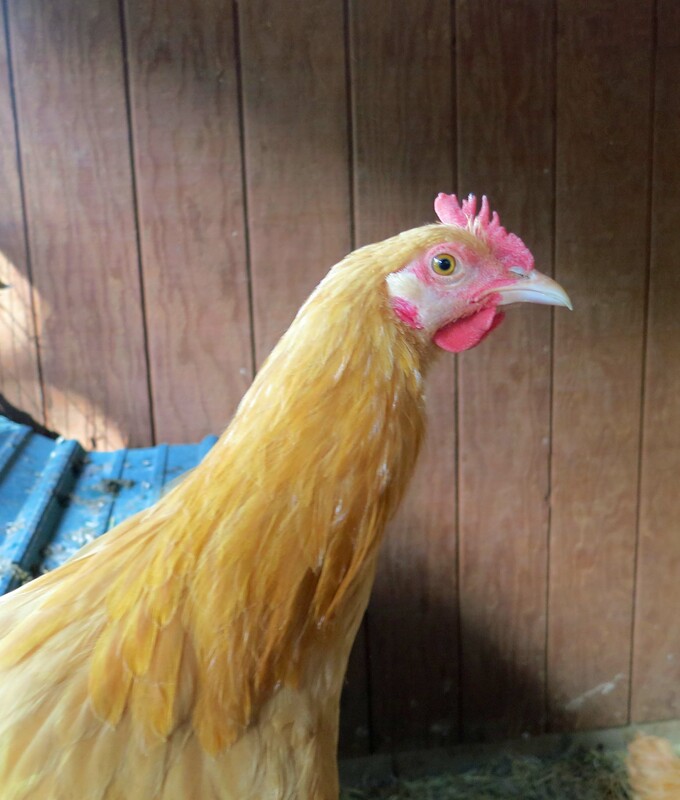 Second, I returned to my home in Gbarnga, Liberia after a trip and discovered a chicken roosting on our stove. It had pooped all over the kitchen. I gladly ate her. Finally, there was the rooster who crowed under our window at 5:00 a.m. each morning and then ran like hell because I kept a bucket of water ready to throw on him. I’ve blogged about these adventures. You can follow the links for the complete stories. The rooster in Liberia convinced me that chickens are relatively intelligent birds. A February 2014 article in Scientific American confirmed this. The article reported that, “The birds are cunning, devious, and capable of empathy. And they have sophisticated communication skills.” A rooster, for example, will squawk a special warning to hens and chicks if he spots a hawk flying over. The same rooster alone in the chicken yard with a competing rooster doesn’t utter a peep, but takes evasive measures, leaving his unsuspecting competition alone with the plunging hawk. Bye, bye. My wife Peggy and I went up to Bryan’s for instructions on Chicken Care 101 before he left. He introduced us to his brood. 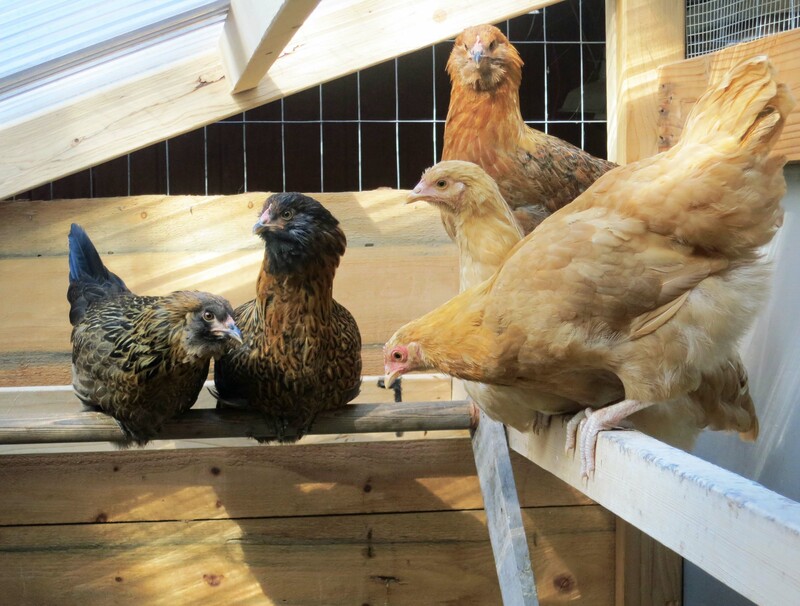 One pen contained the Gang of Four, all egg laying, another six younger hens, and a hormone-driven, teen-age rooster who couldn’t stop crowing about his intentions. The second pen was filled with young roosters destined to being eaten. 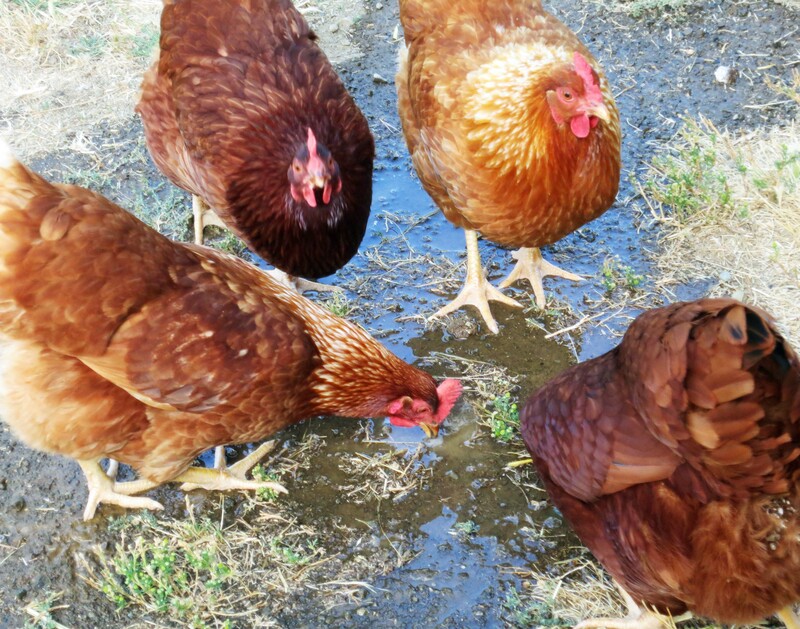 We were to watch the chickens’ water and food, which wasn’t a problem. Bryan had labeled the food bags. But he also wanted us to let the Gang of Four and their cohorts out each morning to wander about the yard to supplement their diet. Fine, I could handle that, but what about getting them back in the pen at night? “And if they don’t?” I insisted. Apparently I was to take his blue plastic bucket, throw in a couple of handfuls of scratch, and then walk into the pen while shaking the bucket. The hens and rooster would follow. I’d be the Pied Piper of Chickendom. Yeah, right. Our instructions in place, Bryan left on vacation. 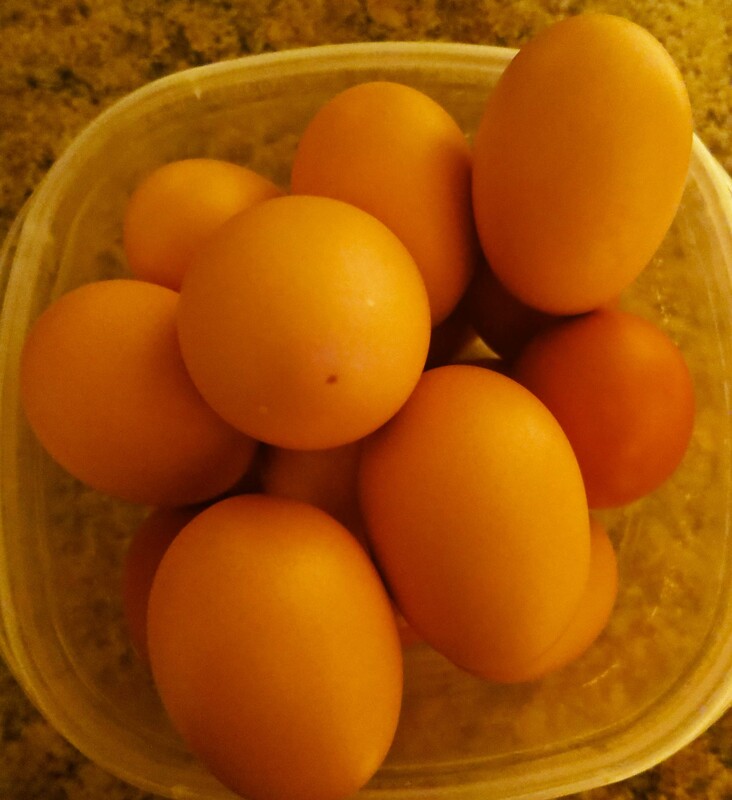 We were left with the chickens, his undying gratitude, and whatever eggs the chickens laid. I’ve already described my encounter with the Gang of Four on the first morning. 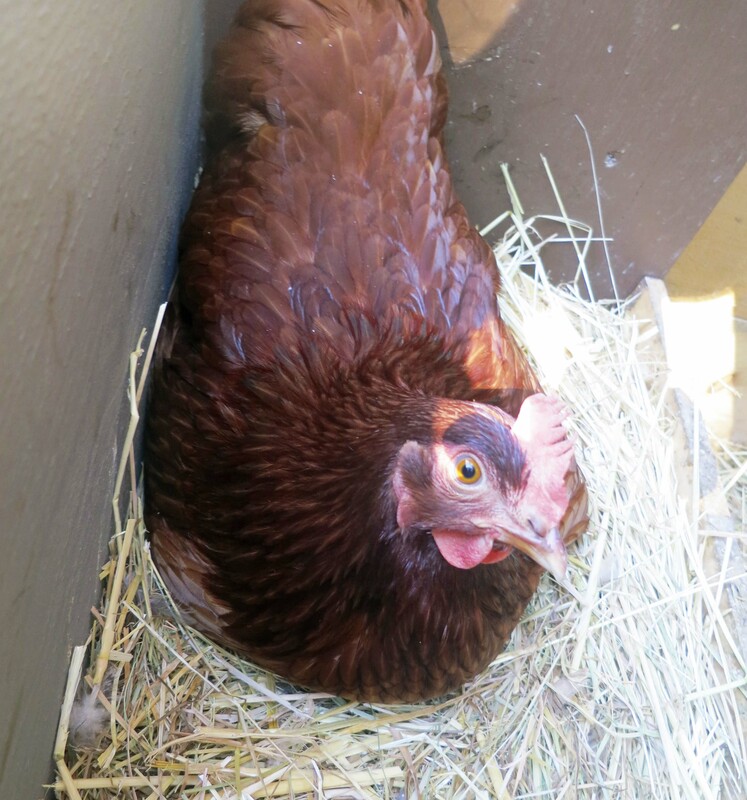 The younger hens had made a dash for the cover of a low-limbed Douglas fir where they liked to hang out. The randy teenage rooster took advantage of the moment to pin one of the young hens to the ground— squawk. It was over in five chicken-clucking seconds. The Gang of Four ignored the ruckus. Any time the rooster approached them, they kicked his tail feathers half way across the yard. The rooster was quite handsome. And he knew it. 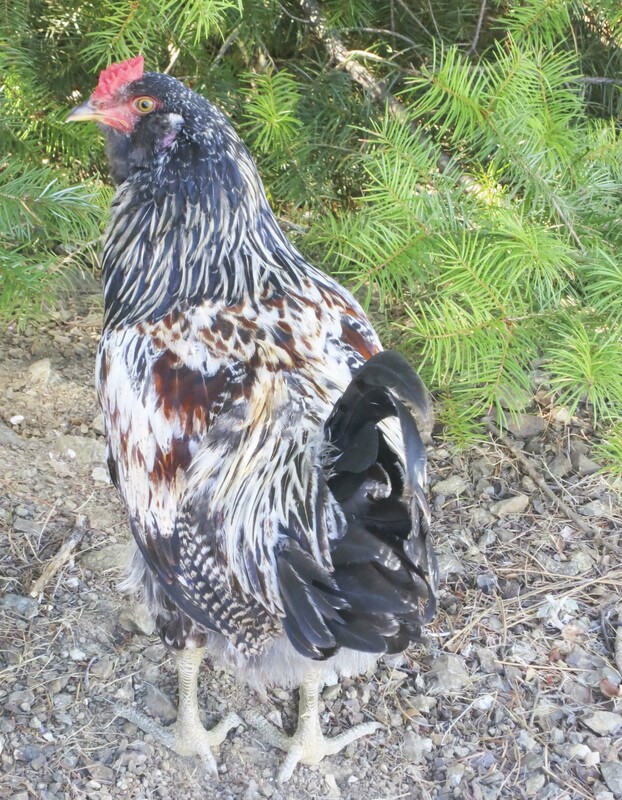 Here, he was about to go under the Douglas fir where the young hens were hiding out. A close up of the cool rooster dude. Letting the chickens out was a no-brainer; getting them back in lived up to my worst fears. When I arrived that evening, the four older hens were happily pecking away in the chicken pen as advertised. Everyone else was still out and about, taking advantage of unsupervised time. I dutifully went to the garage, put scratch in Bryan’s blue bucket, and started shaking it near where the younger chickens were hanging out. Being teenagers, they ignored me. Not so the Gang of Four. They came rushing out of the pen. Great. Now everyone was milling about outside. I shook the plastic bucket and headed for the pen. The Gang of Four and three of the younger hens actually followed me. I sent a brief prayer wafting skyward to whatever god the chickens worshipped and threw a handful of scratch on the ground for thanks. More importantly, the scratch would occupy the girls inside while I worked on enticing the hens and rooster still outside. “Squawk squawk squawk squawk! Cluck, cluck, cluck!” “Oh no you don’t! No, no, no!” A skirmish was going on under the Douglas fir. Feathers were flying. Damn, I thought, the fox has arrived. I dropped the bucket and ran for the tree. Three hens burst out from under the limbs, dashed for the pen, flew up the ramp, and disappeared into the coop. Boy were they fast. Their nemesis— the rooster— followed in hot pursuit. So much for my fox theory. I laughed out loud. Lust had corralled the remaining chickens. I threw the gate closed. Only two chores remained. Bryan had asked that I make sure that the chickens were locked up safely in their coop, not just the pen. The fence that surrounded and covered the pen showed a large dent. Apparently some animal was trying to break in during the night. I made a shooing motion at the chickens and everyone except the Gang of Four made for the coop. Boss Hen looked up at me expectantly and clucked. She couldn’t be shooed but maybe she could be bribed. I walked over to the coop and threw a handful of scratch in the small door. About half missed and fell on the porch. 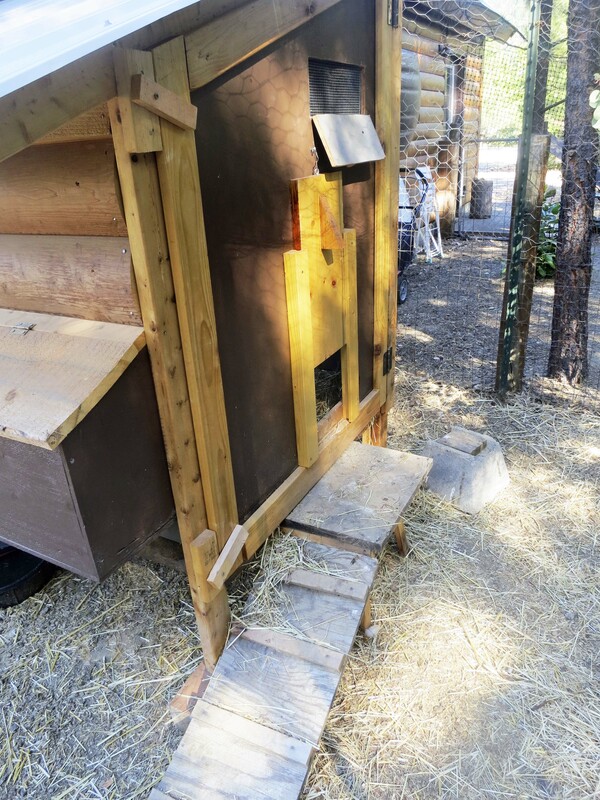 A close up of Bryan’s chicken coop. The box on the side is for egg-laying. The four large hens rushed over and began pecking away. The rhythm sounded familiar: — — .-. . / … -.-. .-. .- – -.-. …. Could it be Morse code? Could the Gang of Four be pecking out “More scratch.”? Nah, I decided, even though the hens looked hopefully at the blue bucket. Finally, they decided that the bucket was empty and rushed into the coop to clean up anything the rooster and hens had missed. I shut the door and breathed a huge sigh of relief. My final chore was to check in on the roosters next door who were destined for a date with a chopping block in the near future. I opened the door carefully to make sure none escaped. They were a handsome group of youngsters. They looked up at me curiously. Their food and water was fine, so I decided to share a bit of Hobbesian Philosophy. The young roosters listened carefully to my sage advice. I warned this young fellow that sticking his neck out might be hazardous to his health. 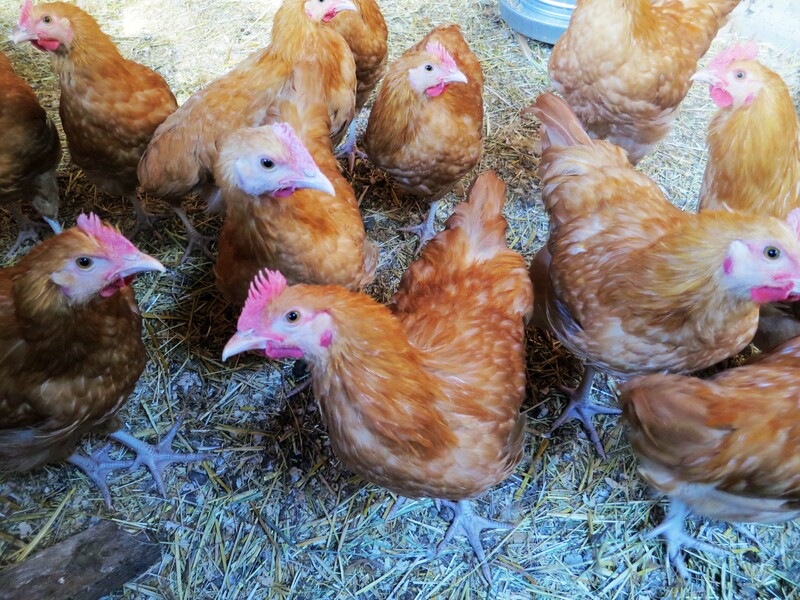 “So, send in the chicks,” one clucked to unanimous agreement. The guys spent their day watching the hens in the yard and crowing about true love, or at least a quickie. One of the Gang had actually flown up to check them out. I wasn’t sure whether she was interested in a specific rooster or all of them. I told the youngsters I would think about their request and headed home for a well-earned beer. Thus ended my first day of being a chicken farmer. There would be several more adventures during the week, but by the end the chickens and I had developed a working relationship. As for the Gang of Four, we had become close. Any time I showed up, they came running and clucking, filling me in on the latest news and gossip. 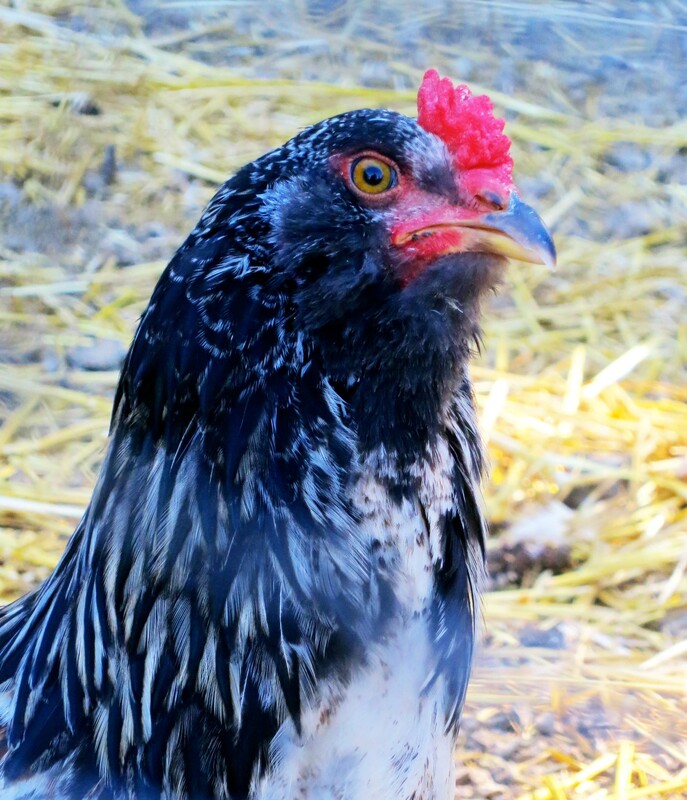 I had become more than a source of scratch; I had become their friend— a Chicken Whisperer. An inside view of Bryan’s chicken coop, which he built, BTW. The exotic looking chickens here are supposed to lay blue eggs. I caught this member of the Gang of Four laying an egg. I don’t think she was happy about being photographed. Part of our pay for taking care of the chickens. The Gang laid between three and four eggs a day. 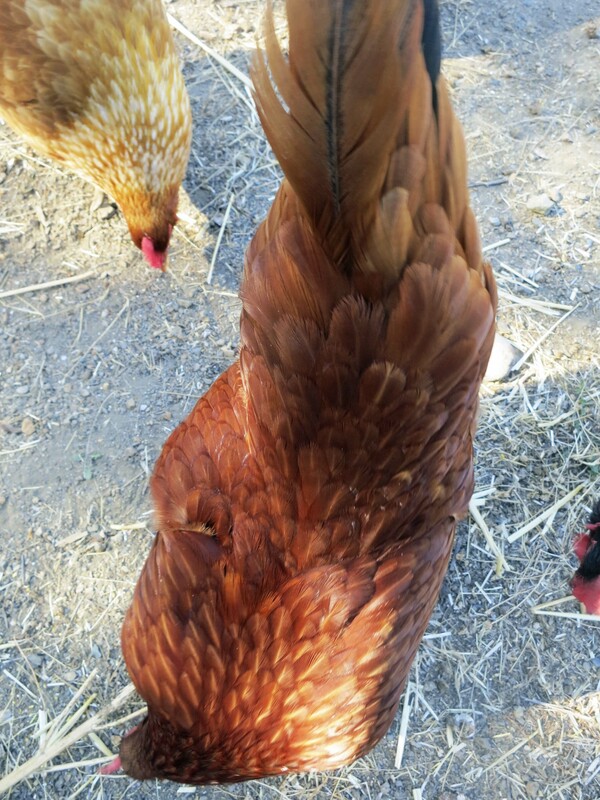 It’s only appropriate that I conclude this blog with a bird’s-eye view of Boss Hen in her favorite position of pecking up scratch.